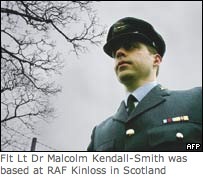 An RAF doctor who refused to serve in Iraq has been sentenced to eight months in jail and dismissed from the service. Flt Lt Malcolm Kendall-Smith, 37, was found guilty of five charges of disobeying orders after he refused to go to Basra last June. He claimed his actions were justified as the UK involvement was illegal. Kendall-Smith told the court that he considered the war in Iraq to be the equivalent of an “imperial invasion and occupation”. He said he was extremely disturbed by America’s “imperial campaign of military conquest”, which was in direct conflict with his duties. This evidence he speaks of isn’t some paranoid lefty fantasy: it’s the many reports of torture and murder carried out by US forces. It’s the photographs of grinning soldiers next to Iraqi prisoners they’ve beaten to death. It’s TV footage of US soldiers shooting unarmed, injured Iraqis dead. From torture prisons like Abu Ghraib to the installation of a puppet government, the US invasion of Iraq seems to have been copied from the Nazi occupation of France and other countries. Similarly, the Nazi’s justified their actions by saying they were pre-emptively attacking a danger to their nation. And that they were “liberating” those peoples. The Nazi’s also had their own troublesome “insurgents” – we call them the French Resistance. The Nuremberg Defense is a legal defense that essentially states that the defendant was “only following orders” (“Befehl ist Befehl”) and is therefore not responsible for his crimes. The defense was most famously employed during the Nuremberg Trials, after which it is named. Before the end of World War II, the Allies suspected such a defense might be employed, and issued the London Charter of the International Military Tribunal, which specifically stated that this was not a valid defense against charges of war crimes. A soldier must remain a human being. When they become robots, that’s when the atrocities are committed. Millions of people died in concentration camps because soldiers followed orders without ever questioning them. That Kendall-Smith is being punished for refusing to take part in a barbaric, illegal occupation based on false grounds is astounding. This is a solider that deserves a medal, not a jail sentence.